Memory Lane Friday is an opportunity to preserve your memories for your family. Each week is a different theme, but you can write about any memory you'd like and link up. This week's topic is "It Was My Friend's Idea". Pretty much everytime I did something troublesome in high school, Callie* was involved. She was fun and vibrant but had a nose for trouble. Most of the time, we didn't get caught, so I won't share those stories. Instead, I'll talk about the time we did get busted. Now I do recall that a lot of the things we did were Callie's idea, but for this particular incident it honestly could have been mine - I don't quite remember. Our high school had a anti-skipping policy. If you weren't in class they let the office know. So Callie and I devised a way around this. Which involved writing ourselves notes, forging our mothers' signatures, and turning them in at the beginning of the day so that our names would be on the absentee or early departure roster. I worked diligently to perfect my mom's signature. On this particular day, we went skipped out in the morning, went to the mall and then McDonald's for lunch. It was great. It sure beat Functions/Trig. There was just one glitch. Callie had forged her mom's note so sloppily that they couldn't read it. So her name didn't appear on the early dismissal notice. And she got written up. Somehow, the Assistant Principal noticed that it seemed suspicious that we both were leaving early the same day. And hence, I got busted too. Somehow, devious minds think alike, and when Callie and I were individually questioned we both left out the part about the mall. We just said we left briefly for lunch at McDonalds. 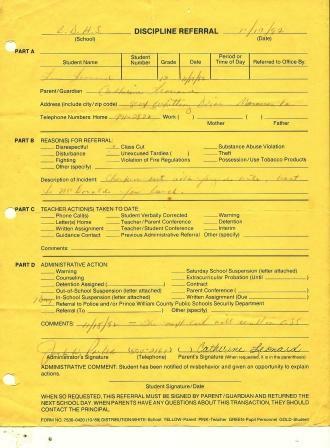 In case you can't read the faded print, the description of incident says "checked out with forged note. Went to McDonald's for lunch." Comments read "11/18/92 -- the next cut will result in OSS"
Note that my mother's signature on this referral is authentic. Actually, I was nervous about breaking the news, but she didn't care much. She just said, "If you wanted to skip school, you should've told me. I could've written you a real note". Somehow, it just wouldn't be as fun if your parent was in on the deception. *The name Callie is not real. I have a policy not to blog about (other than just casual mention) or post pictures of my friends without their permission. Since I didn't consult with Callie prior, I decided to simply change her name. Want to participate in Memory Lane Friday? Copy and paste the code below the button into your blog. Then come back and add your website to the link up (trying McKLinky this week). Hope to see you next week! The topic is: Pictures That Tell A Story. Basically, use pictures to tell a story for you. And write too if you want! Glad your mom wasn't too upset about you skipping. I never did skip because my mom was a cook at the school so she would have known, or the teachers would have said something to her. We only had 350 people in our school from K-12. Wow, I'm glad (and surprised and impressed) that your mom wasn't too upset about the incident! I'm not sure my mom would've been so accommodating! Hahaha! You're a badass!!! I was such a nerd, never skipped out....but wish I had dared to, at least once. sigh. Lisa when are you going to do a blog about the twin's. I wanna know if there walking or talking... I was thinking you where waiting on there birthday. Elizabeth, Sunday's post is all about the twins. That is their birthday. Reid is taking 2-3 steps at a time. Neither one is talking yet! What a fun idea and hilarious story. This is such a great way for your readers to get to know you and for you to get to know your readers!